Hashtag means a word or phrase preceded by a hash or pound sign (#) and used to identify messages on a specific topic. There are a lot of social sharing tools that make up the SMO. The ones that are valid, yet sometimes overlooked or underestimated, are #hashtags. Those are the keywords used for organizing content in social media. They determine what your message, post or photo will be “filed under”. Hashtags are words and phrases, written without spaces and punctuation and preceded by the # sign, that you can find in before, within or after the body of a post or a Tweet. There are many social networks that allow you to use hashtags to put your message in context and attract more viewers. The most obvious advantage of hashtags is that they make you visible to the audience that proactively searches for a certain topic or theme and thus is potentially interested in it. There is, however, more to this sharing tool. 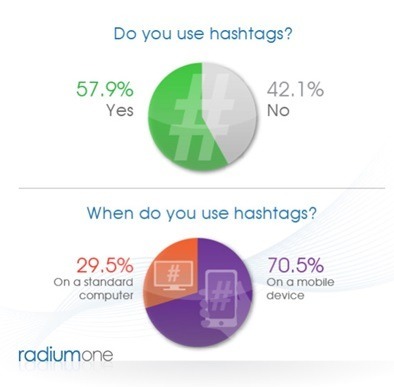 RadiumOne conducted an interesting survey in 2003 to evaluate how consumers perceive, value, and use hashtags. The results showed that over half of the respondents utilize hashtags on a regular basis and almost three-quarters of them are doing so from their mobile device. Hashtags, although relatively new, have already become a popular tool for finding relevant content and sharing it. Moreover, this research showed that hashtags are mostly used on-the-go which creates interesting opportunities for marketers and advertisers. Let’s take a closer look at the hashtag campaigns’ ways and benefits in various social media. Using hashtags is a great way to start a conversation around a chosen topic. If you include the right hashtag in your Tweet, not only will you reach your followers but also all the users engaged in the topic or conversation. At the same time, you can monitor chosen hashtags to stay up to date with what others are saying about your company, your brand or any other related topic. The most popular hashtags on Twitter become “trends”, also called “trending topics”, and are displayed on the Twitter main page (https://dev.twitter.com/media/hashtags). Using them can bring you a significant traffic volume. However, you should make sure the keyword is still relevant to your tweet and content. Moreover, if you use a very popular hashtag, you can simply get lost in the crowd of tweets and become harder to find. You can verify the popularity and the desired hashtag’s meaning by using Twitter Search (Search.Twitter.com) – just type in the keyword you are thinking of to see whether it’s not overused or associated with some other meaning. Hashtags are especially effective with promoting events and conferences on Twitter. You can include a chosen hashtag when sending out invitations and use it when informing or just talking about the event. Not only will you keep your guests posted but you can also attract new potential users. If you operate on a local market, you can consider including your location into hashtags. This way, viewers searching for information on local services, companies and events will easily find you. Recently, Facebook introduced active hashtags as well. This means that a hashtag included in a status update is clickable and it pops out a News Feed that combines other posts tagged with the same keyword. Users can also type hashtags in the search bar to find posts, comments and conversations on a particular topic. It can be an effective way to spread the message to your target group and potential leads, especially if it’s a niche. You can monitor the effect of hashtags on your Page statistics via Facebook Insights (https://developers.facebook.com/docs/insights/). You can choose to tag all the information about your service, product or other project with a unique hashtag. This way, all the tagged posts will be aggregated in a separate pop-out feed, which makes it easier for users to find and share information about it. By researching particular keywords, you can check what the audience says about you. You can also monitor your competitors’ activity and find hot topics that create buzz. In terms of these features, Facebook is still behind Twitter, but it may change in the nearest future because of the mentioned hashtag’s further development. However, some say that Facebook hashtags are bound to be less effective in comparison to Twitter. Firstly, because of Facebook’s login-to view approach as opposed to Twitter’s accessibility. Secondly, while most Tweets are public, on Facebook there is the issue of privacy settings. Facebook is generally a more private space, where hashtags will only be shown to Friends, unless indicated otherwise. Moreover, it seems that the 140 characters limit for Tweets makes its content more orderly and clear which allows an effective usage of hashtags. On Facebook, on the other hand, where posts are longer and content has many forms, including pictures and videos, the hashtags can get lost in the overall clutter. An important characteristic of hashtags is that you can use them across various social platforms. If you included social media in your digital marketing strategy, you probably set up pages and accounts on more than just one or two networks. Nowadays, many social websites allow using active hashtags and those are, among others, Tumblr, Flickr, Instagram, Google + and Pinterest. For effective usage of hashtag as a sharing tool across many channels, you need to stay consistent. To increase action’s effectiveness, it’s a good idea to use the same hashtag across various social media, such as Pinterest or Instagram. This way you gain compatibility and cooperation between different channels to optimize your exposure. Users will be able to recognize and remember your hashtag from other platforms. As with any other online marketing tool, there are certain watch outs when using hashtags in social media. At the end of this article you will find some “DOs” regarding hashtagging. Meanwhile, let’s look at some examples of failed hashtag campaigns to learn about the “DON’Ts”. #Aurora – refers to an attempt of hijacking a popular hashtag from an online store www.celebboutique.com. Aurora was then a trending topic on Twitter and Celeb Boutique used it to promote its Kim Kardashian-inspired Aurora dress. However, the reason for keyword’s popularity was Aurora shooting – a tragic massacre in movie theatre during the film Dark Knight Rises in Aurora, Colorado. The word “inappropriate” is a gentle way to describe this promotional tactic. This is the kind of hashtag campaign that can jeopardize the brand’s image than improve it. Better hashtags get your social media posts found and shared. Among many tools that help you achieve it RiteTag is one really worth to mention. 1. Remember to avoid punctuation and special symbols as they end a hashtag. For example, if you put #Joe’sworkshop, social media will categorize it under #Joe. 2. Search the hashtag before applying it to see how it is already used, how popular it is and what meanings and connotations it has. 3. Make sure that the content you are tagging is relevant to the search results you will appear in. The key to effective hashtagging is providing interesting and valuable input to the conversation. 4. Adjust your tactic to your goal and medium. Sometimes it makes more sense to use unique and rare tags to “own” them. Other times, you may want to enter a stream of trendy yet more generic keyword to attract broader audience. 5. Make sure your hashtag is short, clear, legible and easy to spell as well as remember. You can’t use spaces but you may use capital letters to distinguish separate words. 6. Choose quality over quantity. A post overloaded with hashtags may not work well so apply two or three carefully chosen tags rather that six or seven of them. 7. Promote your hashtag! Don’t hesitate to include it into your website, newsletter, e-mail marketing and any other form of digital marketing activities. Only then will it serve its purpose. 8. Be consistent. Once you’ve chosen a hashtag, stick to it. You can obviously add more tags or select other tags for different topics, but to make a hashtag effective, you need to make it sort of “logotype” of your campaign, product or project. 9. Avoid hashtag hijacking. This means using hashtags that are popular (e.g. trending topics on Twitter) but not at all related to your content. This only brings random traffic and can be considered spam, which can cause negative influence on your business image. 10. Don’t be afraid to experiment and explore. Hashtagging is still a relatively new sharing tool, especially in certain social networks, such as Facebook. It’s still in development, and new features will be added. So go ahead and see for yourself what hashtag tactics add the most value to your business. Hashtag is great tool for organizing contests, sweepstakes, promotions, drawings or giveaways on Twitter. Simply ask your followers to tweet their answer to a question, their opinion, picture or any other desired content, tagged with a selected keyword. Only the tagged Tweets enter the competition. There are many ideas for promotion mechanisms that use hashtags. For example, you can ask for the most creative answer to a posted question. On the other hand, you can simply ask for a retweet of the hashtag and select the winner randomly, thus making it a sweepstake. Another idea is to request uploading photos or ask them to follow you on Twitter. It all depends on your goal. Using hashtags as a tool for contests and promotions brings unquestionable advantages. It makes the event easy to control since it gives you an easy access to all the tweets that take part in it. It’s inexpensive, as you only need to account for the prize cost. Moreover, it encourages the contestants to share your content, which attracts even more traffic to your event. This way, you can truly show the social network’s potential as a promotion tool. It’s worth mentioning that on Facebook, it’s against website’s promotion policy to organize contest, games or promotions using its native features. Therefore, you can’t use hashtags for promotions driven directly on Facebook. There are two solutions to that. Firstly, you can design a separate application for it. Secondly, you can use a fan page to help viewers find the content across other platforms. By using the same hashtag, you can redirect your audience to your promotional action on Twitter or Instagram. As it has already been mentioned, it’s crucial to watch selected hashtags to keep up with the conversations about you and your competition. It may seem difficult with multiple platforms, millions of users and real-time conversations, but there are some tools that may come in handy, such as Tagboard (http://tagboard.com/). It’s a free service that allows you to simultaneously search for hashtags across many social networks.